Your fundraising efforts account for most of The Bridge for Heroes income. It’s what allows us to do the work we believe is so vital and provides support through our support centre. Fundraising possibilities are endless, some ideas are hold a coffee morning, try a sponsored event no matter what the activity is just have fun and raise funds at the same time. 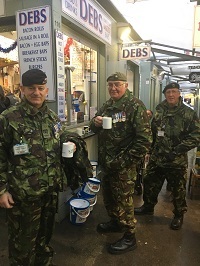 The general public have been extremely generous in donating money to the Bridge for Heroes through the dedicated and committed Guardian Troop who have spent day after day battling all types of weather to raise vital funds. Bury St Edmunds, Cambridge, Dereham, Ely, Fakenham, King’s Lynn, Hunstanton and Norwich Borough Councils have kindly permitted the team to fundraise over the year. Stores that have also provided fundraising days including; Tescos, Dobbies, Waitrose, Sainsburys, Morrisions and ASDA.